Fresh off its biggest monthly gain in 30 years, the Dow Jones Industrial Average struggled to add to its year-to-date tally during the first full week of February as concerns over slowing global economic growth and trade tariffs reared themselves once again. A poor IHS Markit Eurozone Composite Purchasing Managers Index (PMI), and downgrades to 2019 Eurozone and UK GDP reinforced the sluggish demand in the Euro region. Trade fears were inflamed by the U.S. and China not having agreed on a trade deal draft and the acknowledgement that Trump and Xi were unlikely to meet before the March truce deadline expiration. Economic data in the U.S. was light with the international trade report being the highlight of the week. Even though the report showed the U.S. trade deficit narrowing, markets were quick to dismiss the announcement as old news given that the data was from November, which had been delayed by the government shutdown. It may not have been a convincing move for markets, but investors managed to push the Dow back into the black during the final minutes of trading on Friday — adding 0.17% and posting its seventh consecutive weekly gain. Slowing global economic growth continued to weigh on the European economic bloc with the IHS Markit Eurozone Composite PMI falling to 51.0 in January from 51.1 in December. That was the index’s lowest reading in five-and-a-half years. Numbers above 50 indicate expansion, while numbers below 50 indicate contraction. Although output is still expanding, the reading and the trend are both poor. Digging into the report, the manufacturing sector was the primary source of weakness while growth in the service sector remained unchanged. On a geographic basis, declines in output in France and Italy were a drag on increased activity in both Germany and Spain. Overall, the economic bloc appears to have started the new year on a down note, with growth close to stagnation as exporters struggle amid a weak global business environment. With the March 29th deadline for Britain to leave the European Union fast approaching, a no-deal Brexit could lead to even more significant economic disruptions for the Eurozone. The Trump administration scored its first win in its months-long trade battle for fair trade. After five consecutive monthly increases, the U.S. trade deficit fell -11.50% to $49.3 billion in November. Although both imports and exports fell, it was largely the decline in imports that caused the trade deficit to shrink. Imports fell -2.90% to $259.2 billion, driven by a decline in cellphones and other household goods. Exports also fell in November, down -0.60% to $209.9 billion. The decline in exports was due to lower shipments of pharmaceutical drugs and a decline in the value of domestically produced oil (i.e. lower oil prices). The much-watched trade deficit with China also shrank, declining -12% to $37.9 billion in November from $43.1 billion in October. Although this could be couched as a win for the U.S.’s on-going trade fight, the decline in the trade deficit appears to be mainly driven by the comparison to October, which was a period in which businesses were stockpiling goods. The December trade report should give us better insight into the current trade environment. For now, however, the decline in the trade deficit in November bodes well for fourth quarter GDP with economists forecasting as much as a 0.60% boost to U.S. GDP. While Q4 GDP numbers are expected to get a boost from the most recent trade figures, this didn’t seem to matter much for markets this week, who were focused ahead to 2019’s global growth and the state of the U.S.-China trade spat. Investors have been wrestling with these concerns for well over a quarter, but their anxiety had largely dissipated as the Fed changed its tone and as the Q4 2018 earnings season proved to be stronger than expected, up 15.80% year-over-year. Given January’s gains, it is not surprising that investors are looking for a catalyst to convincingly push markets higher. This week’s data didn’t do anyone any favors. The investment case remains grounded in the strength of the U.S. economy, but as we saw this week, trade and Europe (including Brexit) continue to be pestilences capable of quickly unnerving investors. Traders will be pouring over data on retail sales and consumer and producer prices. In overseas action, China reports on trade. With Valentine’s Day coming up, it’s a good time to get your finances in order. 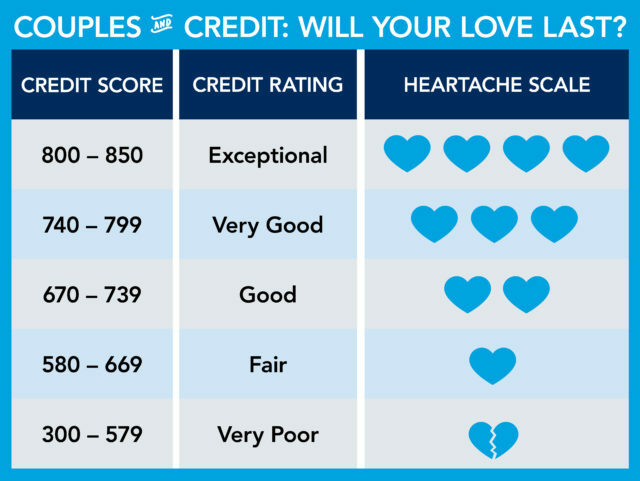 A study by The Federal Reserve called “Credit Scores and Committed Relationships” showed that the higher your credit score when a relationship starts, the more likely you are to commit to the relationship and stay committed. 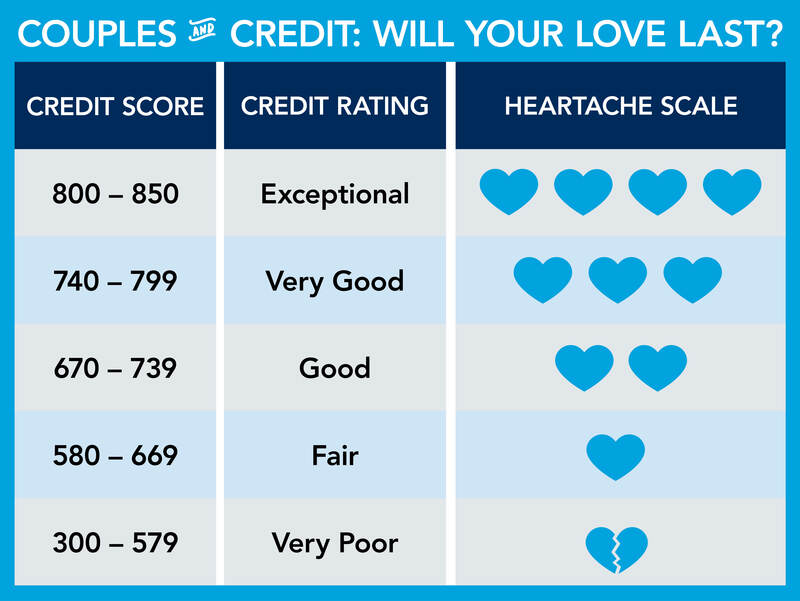 Those with lower credit scores were more likely to break up after the first few years. The Fed followed 12 million U.S. consumers for 15 years, and their research reflects that shared attitudes about money, financial management, and obligations — basically financial compatibility — is highly predictive of relationship success. We aren’t saying other factors aren’t important, but when it comes to choosing between love or money, research shows that more Americans are making relationship decisions with their head over their heart. Some 56% of Americans say they want a partner who provides financial security more than “head over heels” love, according to another study we reviewed. Those same survey respondents also said they prefer a partner who is career focused, frugal, philanthropic, and a saver versus a spender. Valentine’s Day is February 14th, and the holiday will likely put some of these “romance versus finance” insights to the test. The National Retail Federation (NRF) estimates that fewer Americans will celebrate the holiday. Ten years ago, more than 60% of adults planned to celebrate Valentine’s Day; today, that’s dropped to just over half. Consumers who choose not to celebrate say that the holiday is over-commercialized, they don’t have anyone to celebrate with, or they simply aren’t interested. Even as fewer Americans have official Valentine’s Day plans, those who do celebrate will spend a heart thumping $20.7 billion on Valentine’s Day this year. As in years past, the top spending categories will be jewelry, an evening out, clothing, flowers, and candy. Individual spending will reach an average of $161.96 per person. That’s up 13% from last year’s $143.56, according to the NRF’s annual survey. While the number of people celebrating is on the decline, there has been a big increase in those that receive gifts to include not just significant others, but also children and children’s classmates and teachers, friends, parents, pets, and coworkers.